Monster number 17, the ineluctable quarryhound, is a super hunter and will follow a PC to the ends of the earth in pursuit of him or her. The image led me to go with a fey creature rather than magical beast, since I could see powerful fey developing this thing from a collection of animals adept at hunting. I hope you enjoy the ineluctable quarryhound. See you tomorrow with this anniversary edition's first ooze! This odd creature has a fox’s head, a coyote’s body, a wolf’s hindquarters, and the forelimbs of a raptor. Despite its bestial nature, its eyes gleam with cunning and intelligence. Speed 40 ft., burrow 20 ft., climb 20 ft., fly 60 ft. (good), swim 30 ft. Deceptive Charge (Ex) An ineluctable quarryhound can make a feint attempt while charging, with a +2 bonus. Quarry (Su) An ineluctable quarryhound designates a single creature as its quarry. With respect to the hound’s quarry, it receives a +6 insight bonus on attack rolls, deals an additional 4d6 points of damage with its melee attacks, and can deal nonlethal damage without taking a penalty on its attacks. The hound cannot change the target of this ability for 24 hours, and only if its quarry has been captured, killed, or left the plane. Sanctioned Target (Su) An ineluctable quarryhound benefits from constant greater invisibility against all creatures but its quarry. The hound cannot be sensed in any other way (hearing, scent, tremorsense, or even more exotic senses) by non-quarry creatures.. In addition, a non-quarry creature attempting to target the hound with an attack, spell, or effect, or include the hound in an area of effect, must succeed at a DC 26 Will save to do so. The save DC is Charisma-based. Shunt (Su) If an ineluctable quarryhound maintains its grapple on its quarry, it can expend one use of its greater teleport ability to teleport its quarry with it. The quarry negates the greater teleport with a successful DC 26 Will save. The save DC is Charisma-based. Trapfinding (Ex) An ineluctable quarryhound can use Disarm Device on magic traps as per the rogue's trapfinding class feature. 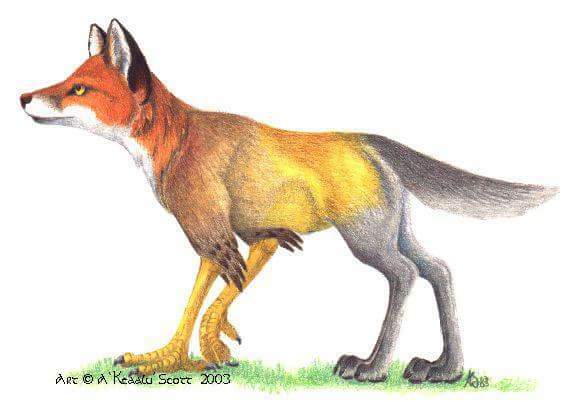 Fey nobles devised ineluctable quarryhounds, combining features from various canids and hunting birds. A collectively bizarre sense of humor decided to make the fox—a typical quarry animal for many mundane hunters—the face of the hounds. Imbued with powerful arcane abilities, the hounds almost never fail to capture or kill the targets given to them by fey nobility. Quarryhounds which fail their assignments (typically because their prey escapes to another plane) become despondent and usually fade from existence after a day, unless they are able to once again relocate their quarry. If the hounds do not have a time limit for capturing or killing their targets, they like to play with their prey. The hounds follow their targets in various guises and leave cryptic indicators that they are hunting their targets. The hounds use their selective invisibility to taunt their targets in plain view, driving the targets to madness as the targets’ companions cannot see or hear the hounds. Once ineluctable quarryhounds have worn down their prey, they use their shunt ability to whisk their targets away, typically leaving an illusory scene behind to throw off pursuit. Ineluctable quarryhounds usually operate alone, but rarely a pack of the creatures receive a task to capture a group of targets, such as an entire adventuring party. The hounds work together remarkably well in spite of their solitary natures. It is during or after these mutual hunts where ineluctable quarryhounds mate, producing a single offspring which both parents raise. The hounds have 500-year lifespans, so they don’t often reproduce. Most ineluctable quarryhounds are sized like hounds from which they derive.